RIO DE JANEIRO, BRAZIL – The Organizing Committee of the Olympic and Paralympic Games Rio 2016 reported that most tickets are sold out for the next two weekends (September 10-11th and 17-18th). The majority of these tickets sold out are for competitions scheduled to be held in the Barra da Tijuca Olympic Park. Ricardo Costa Oliveira won Brazil’s first gold medal in the Rio 2016 Paralympics, photo by Tânia Rêgo/Agência Brasil. 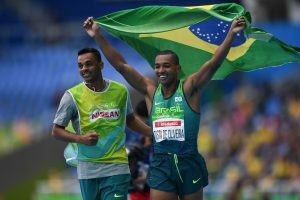 The ticketing director for the Rio 2016 Organizing Committee, Donovan Ferreti told reporters yesterday (September 9th) that the lack of school holidays for the Paralympics has contributed to the increased demand from the fans on weekends. O Globo reported that the Olympic Park in Barra da Tijuca, where most of the competitions are held, will receive 170,000 people today, the largest audience recorded in just one day at the site. Tomorrow, they are expecting 158,000 visitors, and together, Saturday and Sunday will have 8.6 percent more spectators than the first weekend of the Olympics, which took place last month. There are still a small amount of tickets reserved for people with disabilities or reduced mobility, the equivalent of six percent of total tickets, as the law requires. These tickets, if not sold, will be released on the day of the events – in general. Paralympic competitions continue on the Lagoa in Zona Sul, photo by Ana Patricia Almeida/Rio 2016. The director also said that of the 2.5 million tickets available for the Paralympics, 1.8 million have been sold so far, leaving 700,000, with more tickets available during the week days. The result means that Rio 2016 is the second best result in the history of the Paralympic Games after London in 2012, when all 2.3 million tickets available to the Paralympics were reported as sold. On Thursday night (September 8th), the secretaries of state and municipal Transport held a meeting to talk about the operations during the weekend. It was agreed that the Metro Line 4 will run at full capacity and BRT buses will run at up to 30 seconds intervals, according to the demand of the moment. In addition to Barra da Tijuca, transportation in Zona Sul (South Zone) will also be impacted by Paralympic competitions. Today and tomorrow, Copacabana hosts the triathlon competition, from 10AM to 1:30 PM, and on both days, Avenida Atlântica will be closed in both directions, between the streets Rua Francisco Otaviano to Rua República do Peru until 4PM (no tickets are required to watch the race). To purchase tickets for the Paralympics, one must be 18 years of age, and have a CPF number (social security identification number), as well as registration in www.rio2016.com/ingressos site. The purchase can be made online or in the official box offices. Half-price tickets are guaranteed for people aged over sixty and people with any disability. Students and teachers in general in the municipality of Rio de Janeiro will be entitled to half-price in the cheapest price category in all sessions. 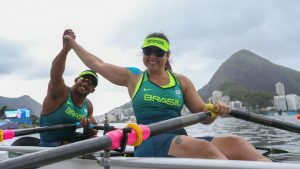 In the medal race for the sporting events, Brazil is currently in fifth place, behind China, Great Britain, Ukraine and the U.S. in the medal race. At the time of writing Brazil has three gold medals, six silver and two bronze, for a total of eleven.